Many Indian dishes require the slowly simmering of ingredients with spices. 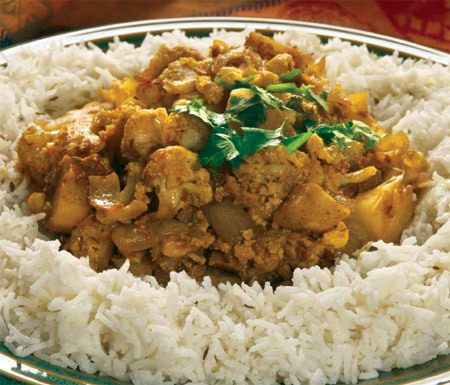 Hours of slow cooking insures aromatic Indian spices infuse well with the ingredients in a dish. Thus, it seems logical that the Indian food should be ideally cooked in a countertop electric appliance known as slow cooker or Crock-Pot. Slow cookers allow food to be cooked unattended in low heat for a long time. The softbound cookbook features 50 Indian recipes cooked using slow-cooking method. The dishes from the featured recipes are illustrated by stunning photography. The recipes are very easy and usually include just prepping the ingredients and throwing everything in a slow cooker for a specific period of time. Most of the featured recipes include classic Indian dishes that are familiar to even a causal Indian food diner. I have used slow cookers to cook Indian lentils stew or Dal numerous time. In “The Indian Slow Cooker”, there are entire two sections on lentils and on beans/peas. I believed slow cooking for Indian food is just for some soups and maybe for meat stew. Singla debunks this myth by narrating an anecdote about herself not believing for the first time when she cooked Aloo Gobi (cauliflower curry) in a slowcooker as suggested by her mother-in-law. I was also amazed to learn that a healthy spicy cauliflower curry could be made in a slow cooker. Other interesting recipes include palak paneer (curried spinach with homemade cheese), butter chicken, traditional chicken curry, minced lamb with peas, lamb biryani and much more. In her book, Anupy Singla also gives a few recipes for desserts such as homemade yogurt and carrot halwa. 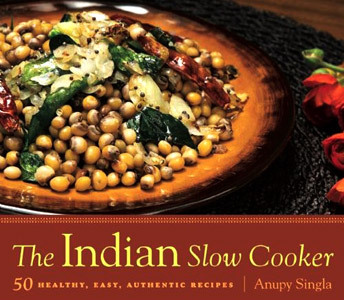 Anupy Singla's “The Indian Slow Cooker” is definitely a unique culinary resource for cooking classic Indian dishes using convenience of a slow cooker. Slow cooking Indian food not only saves time but uses less oil and fat making Indian food healthy. I highly recommend this book to anyone who owns a slow cooker and like Indian food. If you make Indian food at home, and don’t have a slow cooker, I suggest buying a slow cooker and starting cooking healthy Indian food in it. Start with this recipe of Aloo Gobi (Spiced Cauliflower and Potatoes) from the book. 1. Put all the ingredients except the cilantro in the slow cooker. Mix well. 2. Cook on low for 3 hours. Mix once or twice during cooking, especially in the beginning. Eventually the cauliflower will release enough liquid to prevent anything from sticking to the sides of the slow cooker. 3. Add cilantro. Mix well but gently so as not to break up the cauliflower. Serve with roti or naan and a side of onion and cucumber salad. To make this dish in a 3½-quart slow cooker, halve all the ingredients and proceed with the recipe. A half recipe makes 4 cups (946 mL).